Pawtropolis.com - the city that's gone to the dogs...and cats, too. Can We Take Your Pet? Got a dirty dog but no place to bath her? 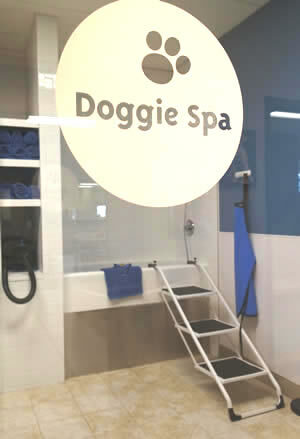 Bring her in and use our Self-Service Doggie Spa! Tired of bathing your St. Bernard in your apartment bathtub? Get a pain in your back bending to bath your toy poodle? Drains getting full of hair? Don't fret, just come to Pawtropolis. 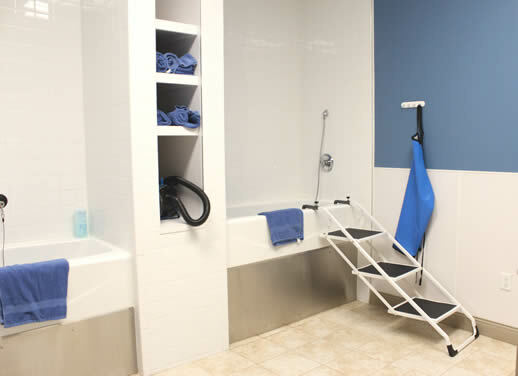 We have two raised tubs, complete with hand-held nozzles and all the necessities to make bathing not only easy, but fun. And the best part - we do the cleaning up! 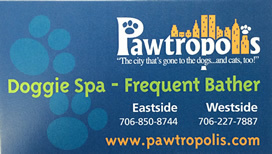 Grab a Doggie Spa Membership Card and even earn free baths. We provide cologne, towels, hand-held dryers, shampoo and more. No appointments needed, just stop by either location anytime before 6:30 p.m. Pick-up a Frequent Bather Card and your 6th bath is free! Need professional grooming? 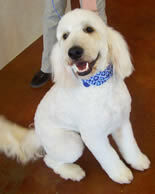 Click here to learn about our grooming services. Keeping your dog clean is about more than just having them smell good, it's for their health. Dirt and oil that build up on your dog's skin makes a wonderful breeding ground for parasites. Long haired dogs not kept clean are prone to heavy matting that sometimes causes the fur to have to be shaved off. Simply having smelly fur won't hurt your dog, but sometimes a smell can indicate a health problem. For example, ear yeast and infection has a very distinct smell. Many owners misdiagnose this smell as the dog needing a bath, however, ear problems need to be addressed specifically and until the smell goes away the infection is still there. We recommend dogs getting their ears cleaned at every bath. Tired of all that shedding with your short haired dog? Regular baths help take the dead fur off where you want it...in the tub. A quarterly deshedding makes a big difference too. The most important thing you can do is keep your dog's nails cut short. In order to maintain the proper length we recommend trimming them at least every 2-3 weeks. A clean dog is a happy dog! We have great pets available for adoption!